One might think that cooking food on a stick is simply a matter of sticking food on a stick. (With me so far?) Ah, but there’s a fine art to it. Which foods taste best when on a stick? How to keep food on a stick from falling off of a stick? Does everything taste better on a stick? (Yes.) These are all worthy topics to explore. 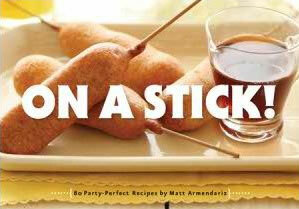 The new cookbook On a Stick! by Matt Armendariz looks to answer a few of these delicious questions. Plus tricks for using sticks and skewers like cocktail picks, sugarcane, and fresh rosemary, ideas for entertaining, and quick and easy recipes for delicious homemade marinades, dips, and sauces. See for yourself why everything tastes better On a Stick! Matt Armendariz is a man with a passion for good food and a wonderful life with a dash of irreverence, as evidenced by his entertaining food blog, mattbites.com. His work has been recognized by numerous shows and publications, including The New Yorker, Bon Appétit, House Beautiful, Epicurious, Serious Eats, and Everyday Food, and he’s even baked cookies with Martha Stewart. He lives in Los Angeles.